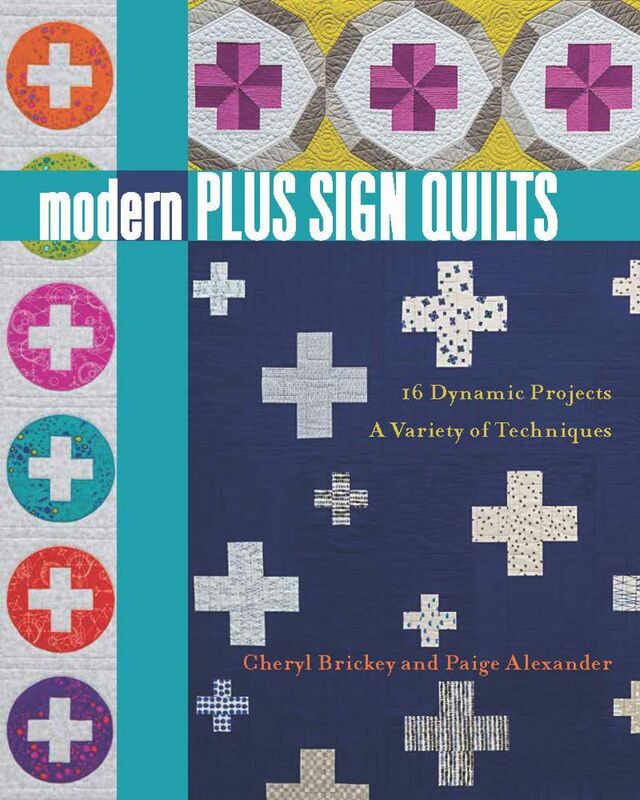 Modern Plus Sign Quilts Book Hop is here! Welcome to my turn on the Modern Plus Sign Quilts Book Hop. I’m so excited and honored to participate in this event! This is the first book collaboration for Cheryl Brickey of Meadow Mist Designs and Paige Alexander of Quilted Blooms, the authors of Modern Plus Sign Quilts. 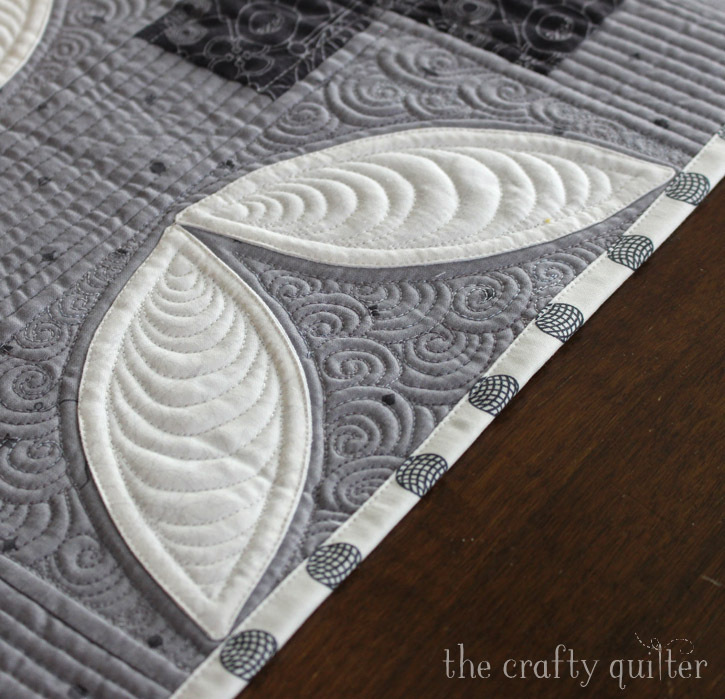 This book is rooted in tradition with a classic block that is set in modern quilt designs. There is something for everyone in these pages, and you’ll find that it is well-written and full of beautiful projects to make and tips to guide you along. 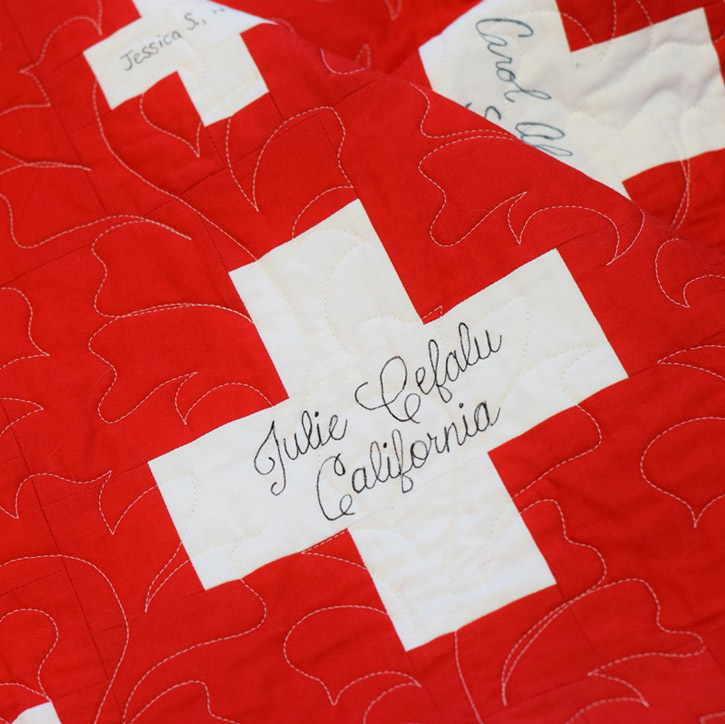 One of the quilts from the book, Signature Plus, is made up of 122 signature blocks – including mine! I am so proud and excited to be a part of this book in such a meaningful way. For my part in the book hop, I chose to make the quilt, Petals Plus. I love anything with an orange peel design and a little applique doesn’t hurt either. 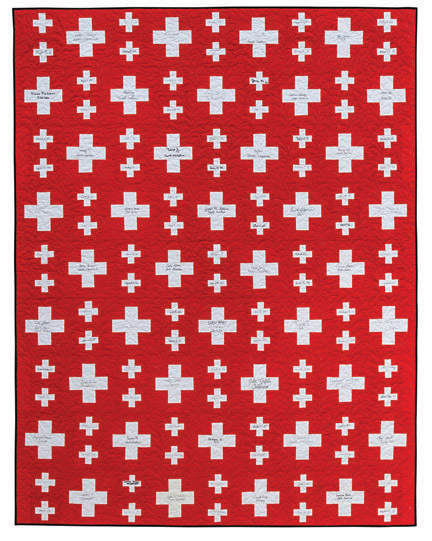 The original pattern from the book is a bed-sized quilt, 66″ x 88″, shown below. I wanted to make this project into a table runner. In order to make it fit, I had to change the layout just a bit. I used the plus signs down the center of my table runner and a half-grouping of petals on each side. My color palette is definitely not within my normal range of bright colors. I chose black, gray and white; ironically using Alison Glass fabrics which are typically a very bright, rainbow-colored palette. This will give me the opportunity to accent it with some other colors. 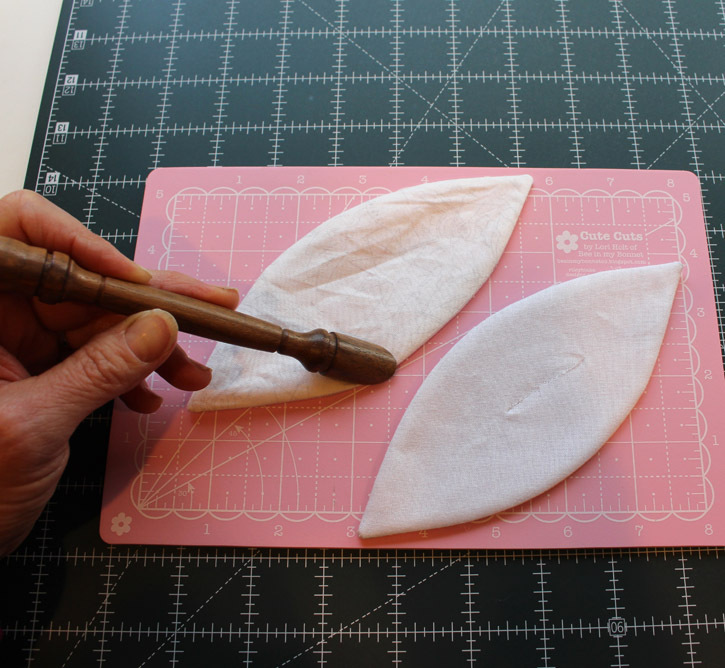 Instead of using raw edge, fusible applique for the petals, I did a turned edge, faced method with fusible interfacing. You can read more about my method here. One of the reasons for this decision was that I wanted an extra layer between the petal and the background fabric to avoid shadowing. I think it worked! 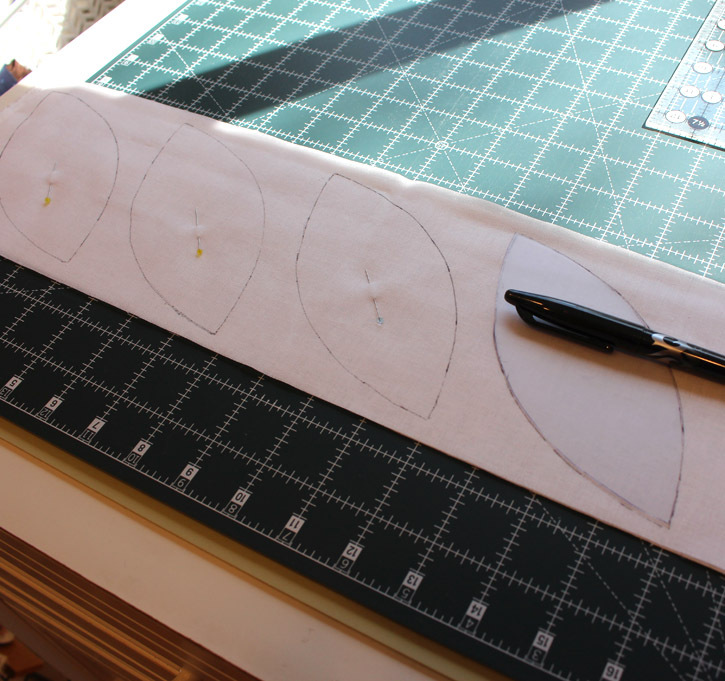 Traced petal shape onto fusible interfacing and placed RST onto fabric. Petal stitched, turned right side out and edges smoothed. Petal placed and fused onto background fabric. 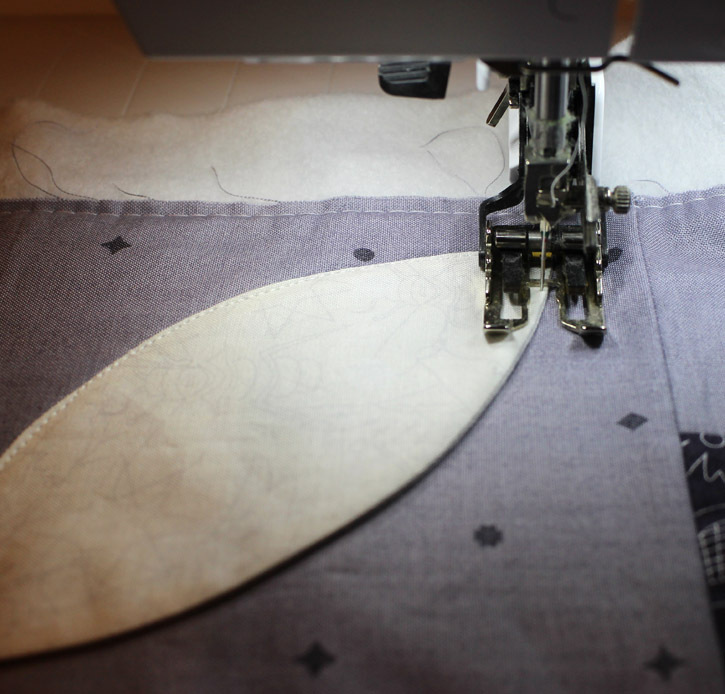 The petals were stitched down by machine during the quilting process – so I saved lots of time in the process. Fast and efficient is my motto! I was a little stumped when it came to deciding on a quilting plan. I began with straight lines along the “plus” sections. I used my straight ruler and free motion ruler foot which also saved time. I thought that some echo quilting around the petals would look nice but quickly changed my mind. I rarely rip out quilting, but I’m so glad I did. Plan B was a much better option – swirls on the outside and echo scallops on the inside. 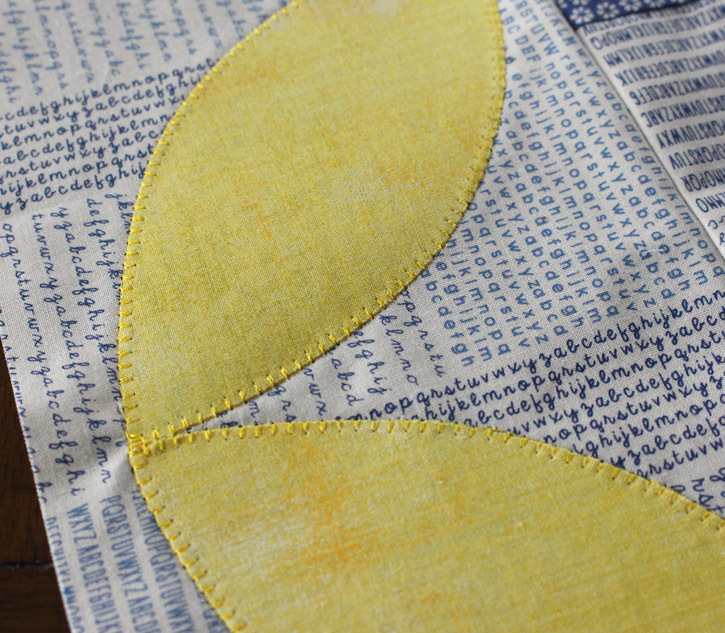 The binding is machine stitched on both sides – another time saver. And the back of this table runner got a “plus” sign, too. 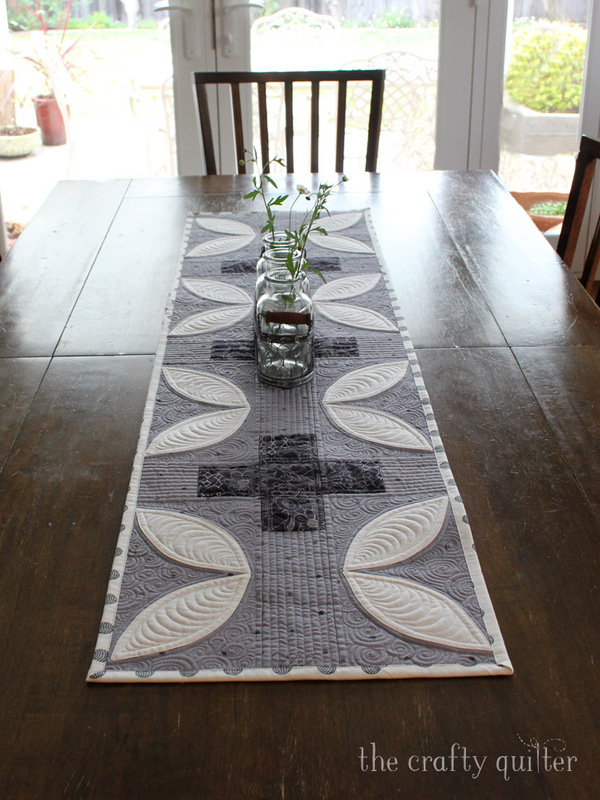 I’m really happy with my new table runner. I think this pattern is so versatile and would be beautiful as a bed-sized quilt as well. 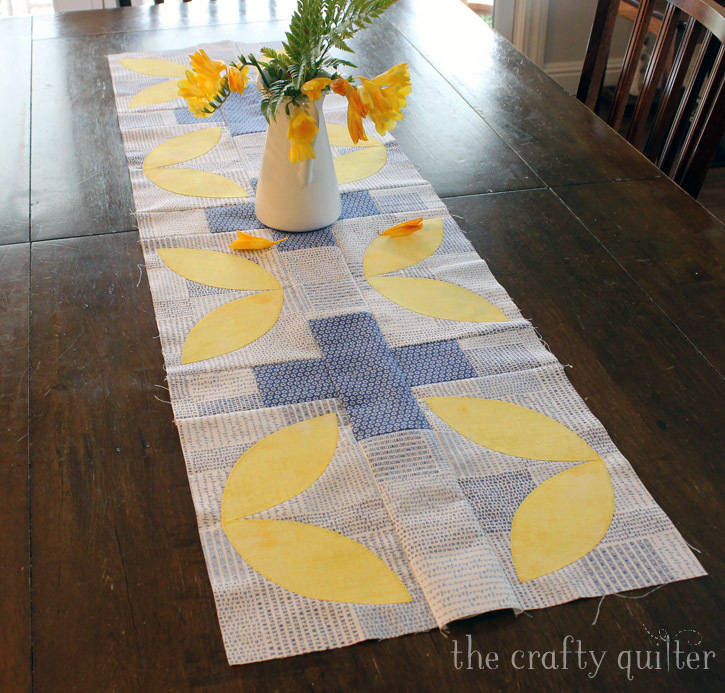 But, I have already started my second table runner using a blue and yellow color scheme. It’s so bright and cheerful! I flipped the petals around and I like how it looks. I also used the fusible machine applique technique as described in the book. 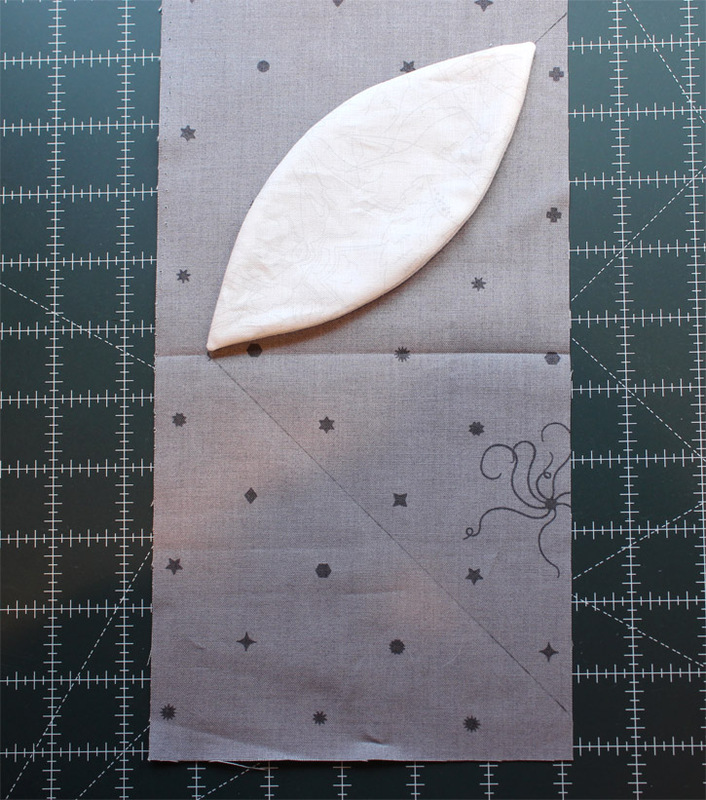 I blanket stitched around the petals; the shape has such a gentle curve that it’s an easy one to tackle for beginners. It was such a pleasure working with Cheryl and Paige on this book hop. They are also hosting a giveaway each day of the hop, so make sure to stop by Meadow Mist Designs and Quilted Blooms. And don’t forget to visit the rest of the participants so you can see their versions of the other quilts in Modern Plus Sign Quilts. Julie, both table runners are stunning! You’ve inspired me to order the book! Thank you! Happy Easter! Thank you for sharing all of the details for each project. I always learn something from reading your blog posts. Both projects are great, I am going to have to get a copy of this book. 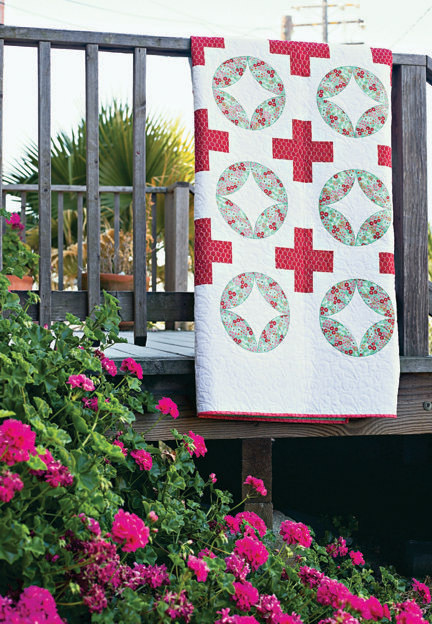 Love your version of this pattern – the design, the colours and the gorgeous quilting. The runner looks wonderful in your kitchen. Beautiful photography. I wouldn’t have envisioned this in black and white, but I love what a sleek, modern look it has. 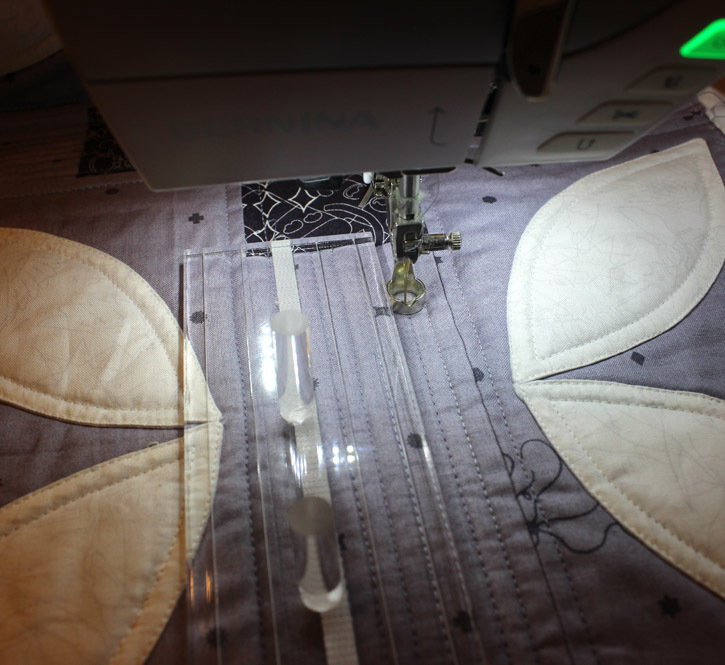 It was very well thought out to apply the fusible interfacing method to the first runner. I also hate ripping out quilting though your final quilting choices are very nice and perfectly fitting to enhance the design. It’s neat to see how the pattern looks with your altered colors and arrangements. I love both versions. Great adaptation. Also love the quilting you did! 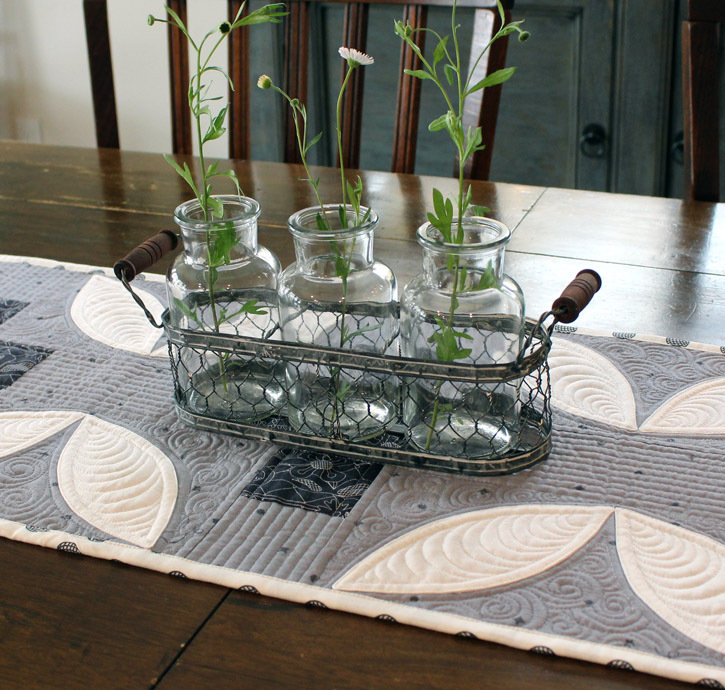 I love how you adapted the pattern to create the table runners. Both feature color choices that really make the pattern come to life. And the quilting! Oh my. It was so, so worth ripping out your original quilting for the final result. Wonderful! I love this adaptation! It’s really clever, and the black/white/gray combo is lovely. It’s a very elegant runner, and due to the bunny, I think of it as an Easter runner! The quilting is spectacular too and really highlighted the piecing. I love both versions! Beautiful. What an ingenious adaptation!! The table runners are beautiful. Your blog is a great inspiration as always. Thanks! Wow, look at you with a second runner done, ready for your beautiful quilting! I like the petals flipped too, but either way, your layout is great. I’m like you, rarely rip out quilting, but in this case you were absolutely right; love the swirls, and love the design (Angela’s right?!) in the petals. I’ve used it before, such fun and such a great effect; it is perfect on the petals. What is that smoothing wooden stick you are using? Brilliant take on the pattern! I am proud of you for doing this twice with such different looks both times. Each one is special but the blue and yellow is my favorite. It’s lovely, Julie! I have to admit, at first I thought it was a black and white photo to show value contrast! It was just not the colors I’m used to seeing from you! But it looks great and I also like your cheerful version-in-progress with cheerful yellow. 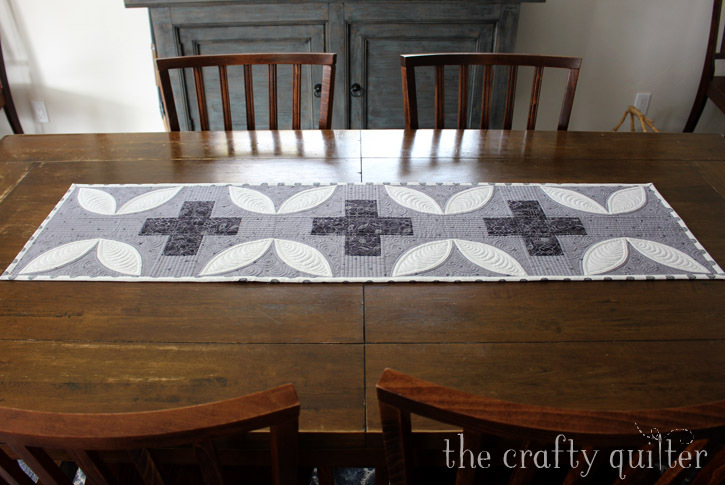 I just love how you’ve adapted this pattern for a table runner. Beautiful balance with the design and the colors. Outstanding photos, too. 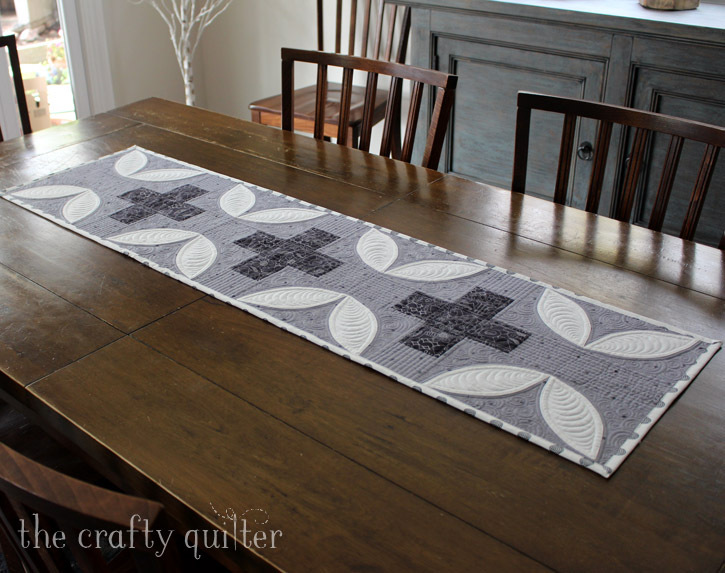 Both versions are very beautiful and I love the reverse side of the first table runner. 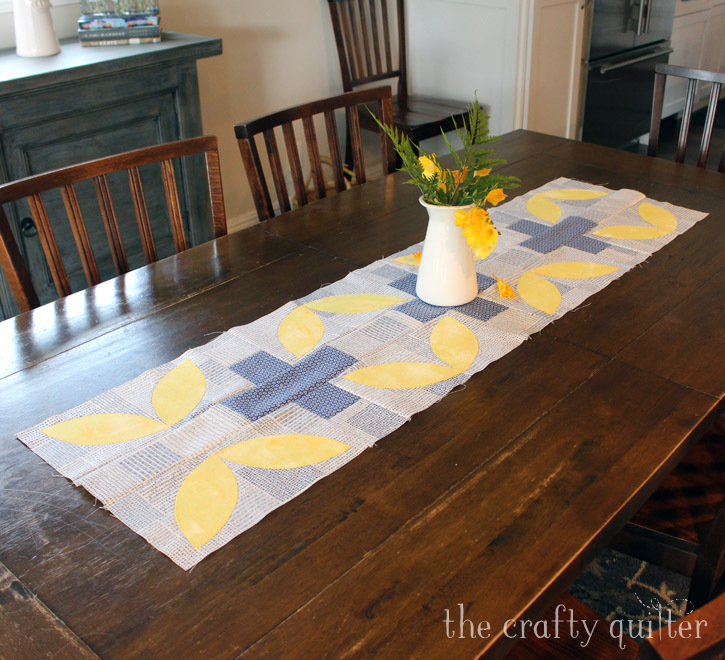 Dear Julie, I fell in love w your table runners! But I don’t know how these things work…do you sell your pattern separately or is it “owned” in the pub rights of the book? Forgive my question…I honestly have no idea!! Thank you for your inspiring work!! I love both of your choices. The differences in approach for the appliqué gives me two very good methods for my favorite technique. I look forward to your posts and meeting your blog participants. Just wonderful! I think your decisions on quilting were terrific. Yes, we do have to sometimes rip out to make what we want work better. It really is fun! 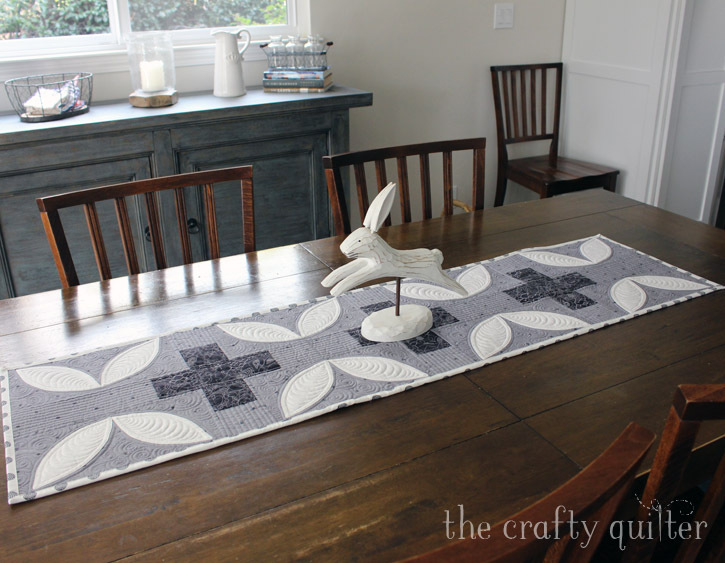 Love the table runners and quilting. Love, love your tablerunners – such colors – wonderful! Thank you! I love your table runners Julie!! The way you cut the pattern down to a single row is fantastic and I love each colorway you used (and your quilting is awesome)! Thank you so much for being part of the hop!! A beautiful pattern adaptation, Julie, with both table runners!! I really am taken with your blue and yellow runner, with the petals turned the other direction! Sew beautiful!! They are both wonderful, but the first way with interfacing under the fabric, for the petals , that is so good for the white. Yellow, looking so good too, One for summer ,one for winter maybe. 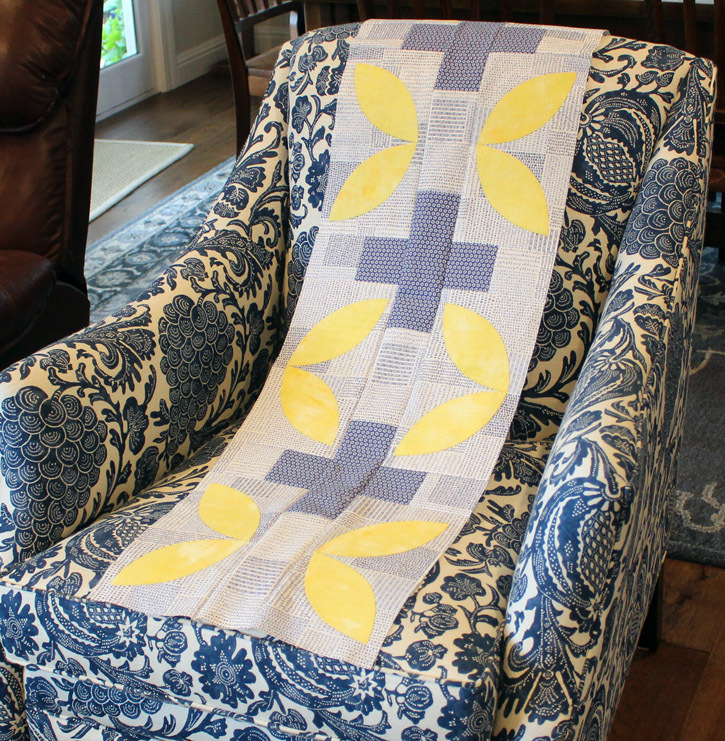 Wow Julie I just love your runner – what a gorgeous version of the quilt from the book. The colours are beautiful and look great with the greenery accent …. I am very inspired to have a go now! Your quilting works wonderfully on it. Both table runners are beautiful. The greys, whites and black, blues and yellows are all perfect. What beautiful table runners Julie. 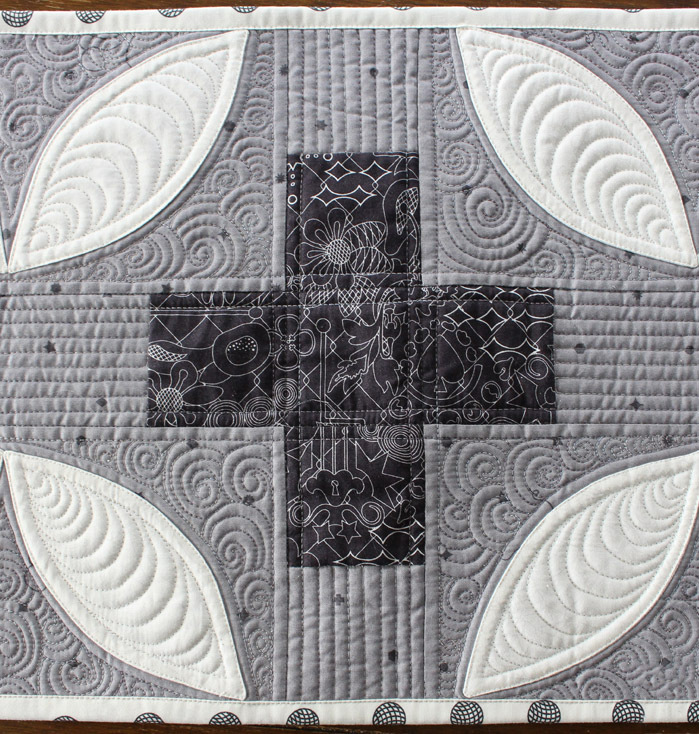 I love the black, grey and white and the quilting is so awesome. One wouldn’t know you had used that easy method of applique if you hadn’t told us. Thank your for the ideas on how to change things up. The table runners are gorgeous! I think I love the gray one best. I love your both table runners. Thanks for sharing your process! So cute! I haven’t done much applique, but I watched your tutorial. Maybe I will try it when I get the chance. And I see you can get lovely results! I admire your eye to be able to envision a table runner from the beautiful bed-sized quilt! How pretty both of them are! I especially love your variety of quilting that keeps my eye moving all over! What a beautiful take on the original design! Both runners are gorgeous…great pictures! Both these versions are fantastic! I’m inspired! 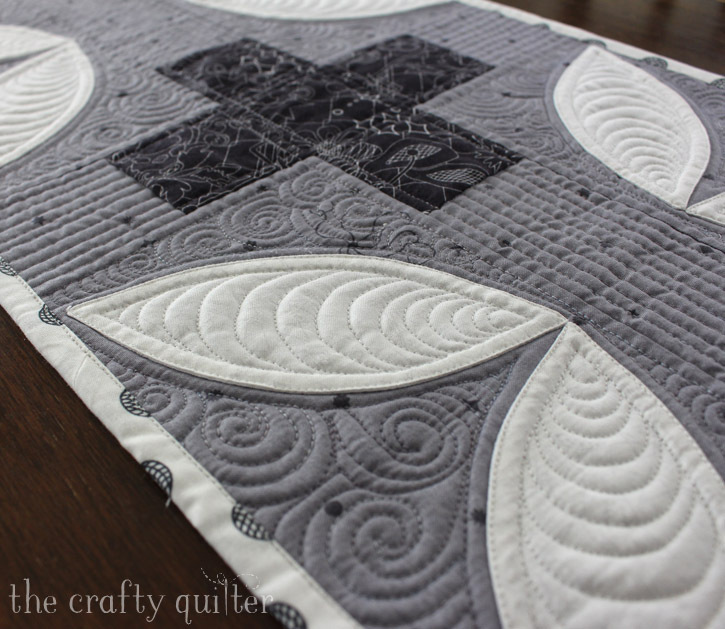 Definitely worth re-doing the quilting – it’s superb! 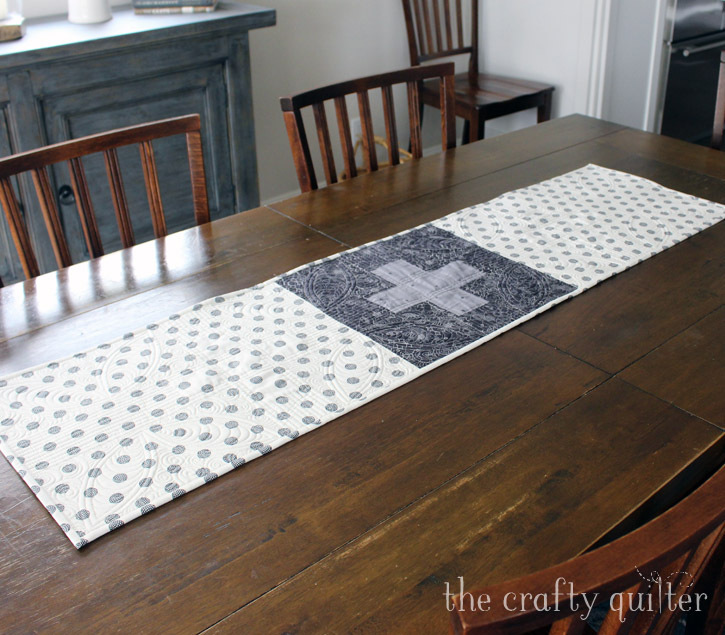 That made up wonderful as a table runner, great idea! 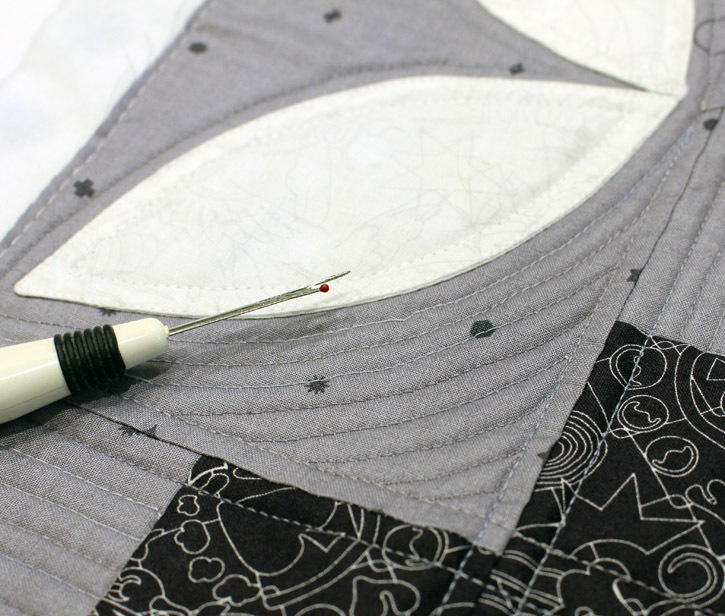 I frequently stitch my appliques as part of the quilting too, so much easier and quicker as I do it on a longarm. Wow, stunning table runners! I love how reducing the design down to a row really emphasizes the feeling of petals versus an orange peel design. Really beautiful Julie. I love it!!!!!! Both of your runners are absolutely lovely! You make the machine appliqué look easy. 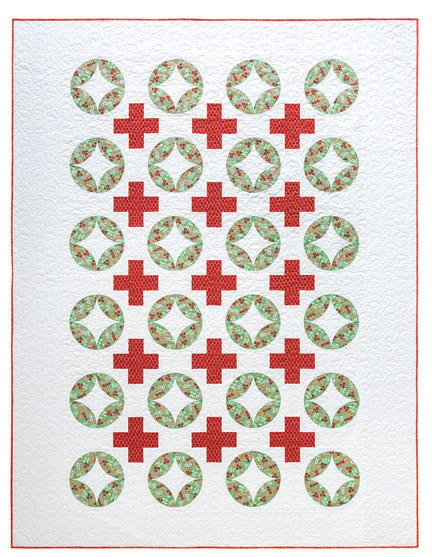 I have been looking for a tutorial on the flipped fusible webbing appliqué. I am glad I stopped by. Thanks. Julie, I can’t decide which is my favorite! You’ve done a lovely job with both methods of applique! Thank you for contributing to the hop and making a signature block for Signature Plus. Your handwriting is beautiful! What a beautiful runner. I love your version of the pattern. Beautiful runner! Love your quilting. Two beautiful versions of this pattern. Ahh, Julie, you’re a genius! You’ve got a natural talent for making a pattern yours, and when you start with such a fabulous pattern, you get fabulous ‘plus’! My SIL just made Crafty Daughter a new dresser and she needs a new table runner for the top. Her address is…….;)! Thank you for your wonderful inspiration, again and again! I’ve made one plus quilt and what I’ve seen from this book has me inspired to make more! Your runner idea is wonderful and I really like the quilting on the grey one. Two beautiful tablerunners, Julie! I love them! My copy of the book should be here today and I can’t wait to try some of the patterns. I’ve been obsessed with plus quilts for years and now is the time to make some! You have cleverly used the pattern to create a lovely runner and the close up pic shows the potential to make matching placemats too. The spring version is lovely but my favourite it the black, grey and white. A creative use of the pattern, love it.